Social media is a serious and fast growing phenomenon for creating and maintaining social links. The convergence of social networking and mobile media technology is also shifting the way people communicate, and gain or share information, even in emergency or crisis situations. Social media, especially social network providers like Facebook, Google+ and Twitter have high impact when citizens share their observations, opinions and emotions, and this is not restricted to normal life events. On catastrophes throughout the world, like the Loveparade disaster 2010 in Germany, the massacre at Utoya 2011 or the earthquake in Japan 2011 with the nuclear disaster in Fukushima and hurricane Sandy 2012 social media have been widely used. Wherever emergencies or crises occur, ad-hoc communities are built through existing social media channels. But these communities are often not connected at all or perhaps are weakly connected to the emergency management services (EMS) and the corresponding emergency management processes. Hence a systematic research project concerning the effective identification and integration of valuable and reliable information from social media into emergency management processes is needed. 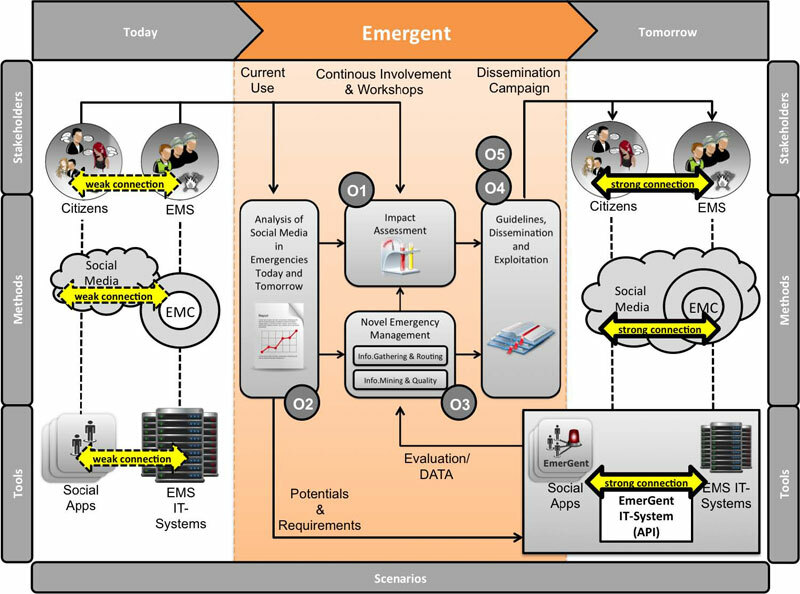 EmerGent (Emergency Management in Social Media Generation) is that project. 1. enhance objective and perceived safety and security of citizens before, during and after emergencies. 2. strengthen the role of European companies dealing with services and products related to the aimed research and development results. The overall concept of EmerGent is shown in Figure 1. The overall concept of EmerGent is shown in the figure above. Today the “emergency management cycle” (EMC) with its phases does not capture social media (represented by the cloud on the left hand side) with its highly valuable information. Although existing social apps (e. g. for mobile devices) are sometimes used by citizens to share their observations and feelings, these are only weakly connected to existing EMS systems. To achieve the goal of EmerGent (right hand side in the figure) the consortium has developed a strong research oriented methodology (centre of figure). Within the “Analysis of Social Media in Emergencies Today and Tomorrow” (O2), EmerGent investigates the current use of social media in emergencies, and future potentials for citizens and EMS involvement within the EMC through social media. It also performs an analysis of the methods and tools for citizens and EMS to integrate on a technical level. In this context EmerGent will research how and when social media can provide useful content to improve the awareness of the situation during emergencies, investigating how people react to information provided on social media and their consequences trough analysing its effects. This will help to derive guidelines for EMS in order to provide the right information in time. The results of the analysis will be used to assess the impact of social media in emergencies for citizens and EMS (O1). For each phase in the EMC, studies will be performed to reveal integration and cooperation. Supported through continuous citizens and EMS involvement through social media and workshops this includes the acquisition of users who will participate long-term as well as the development of basic infrastructures to maintain and support relationship via social media. Social media marketing tools will be used within the project from very early stages of project execution to support this. Further input comes from the IM and IQ assessment on gathered data. The methodology of the impact assessment consists of case studies, analysis of emergencies in the past where social media played a crucial role, workshops with experts and deep content analysis to get knowledge about feelings and reactions on both sites. To handle the vast amount of valuable and distributed information, methods for Information Mining (IM) and Information Quality (IQ) will be developed to classify and rate the available and provided6 data from users. Information gathering (IG) and Information Routing (IR), including the development of new social apps, is done as part of the “Novel Emergency Management” (O3). The development of new social apps is undertaken to obtain and provide visualisations of the most relevant information (as assessed by EmerGent) integrated with several social network providers. All analysis and impact assessment results will lead to the creation of guidelines (O4). These guidelines will enable EMS and all other involved stakeholders to understand the benefit of social media and its integration into their process on different levels (conceptual & technical) (O5). The insights from the studies will be incorporated into these guidelines. Through the collection and presentation of Information, the analysis of social media in emergencies and the development of IM and IQ methods, an IT-system for the “Novel Emergency Management in Social Media Generation” will be developed. demonstration under grant agreement no 608352.